(2012). Photocatalytic and Magnetic Behavior of Fe2TiO5-5A Zeolite Nanocomposites. International Journal of Bio-Inorganic Hybrid Nanomaterials, 1(2), 115-122.
. "Photocatalytic and Magnetic Behavior of Fe2TiO5-5A Zeolite Nanocomposites". 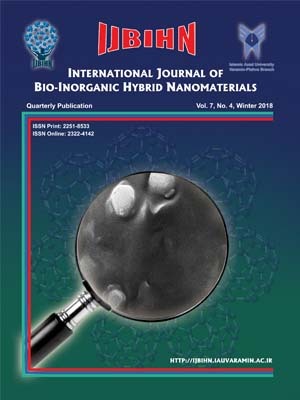 International Journal of Bio-Inorganic Hybrid Nanomaterials, 1, 2, 2012, 115-122. (2012). 'Photocatalytic and Magnetic Behavior of Fe2TiO5-5A Zeolite Nanocomposites', International Journal of Bio-Inorganic Hybrid Nanomaterials, 1(2), pp. 115-122. Photocatalytic and Magnetic Behavior of Fe2TiO5-5A Zeolite Nanocomposites. International Journal of Bio-Inorganic Hybrid Nanomaterials, 2012; 1(2): 115-122. In this paper we report synthesis of Fe2TiO5-5A zeolite (Z5A) nanocomposites with 5%, 10% and 20% weight percent of Fe2TiO5 in 5A zeolite in stearic acid media after calcination of the gel samples obtained at 600-900°C for 2 hrs. The powder X-RAY diffraction (XRD) patterns have been used for characterization of the prepared samples. The Scanning Electron Microscopy (SEM) images and X-ray Energy Dispersion (EDX) results were used to determine the size and composition of Fe2TiO5-Z5A nanocomposites. Differential porosity value of Fe2TiO5-Z5A nanocomposite samples in comparison with the 5A zeolite were obtained by Brunauer-Emmett- Teller (BET) method. A Vibrating Sample Magnetometer (VSM) was used to determine magnetic behavior of 20% Fe2TiO5-Z5A and pure Fe2TiO5. The results indicated the change of Ferromagnetism to the superparamagnetism behavior due to the small particle size and a high value of calcan and methylene blue degradation (63 and 99% respectively) for 20% Fe2TiO5-Z5A.